Episode 32: "Something Old, Something New"
A burglar breaks into an apartment and is witness to a murder. As he flees the scene, he is stopped by a police officer on patrol. Later that evening, Charlie Chan and son Barry arrive at the same apartment and are met by Alice Gardner, who was the housekeeper of the murder victim, Helen Crane who, Chan determines, had been stabbed to death some hours earlier. Alice explains that Mrs. Crane had let her off for the evening while the Cranes were to be at an engagement party for their daughter, Julie. Chan informs Alice that the late Mrs. Crane had made an appointment to meet with him that same night. On closer inspection, Chan finds a spool of white thread in the victim's clenched hand as Inspector Duff of Scotland Yard arrives on the scene as he had come to investigate stolen items containing identification that had been found on the arrested burglar. Duff informs headquarters that the thief, Pete Wilson, is probably the murderer of Mrs. Crane, but Charlie Chan is not so certain. Interviewed by inspector Duff and Charlie Chan at Scotland Yard, "Second Story Pete" pleads his innocence, telling how he witnessed the killing of Mrs. Crane, although he was not able to see who actually committed the murder. Upon questioning by Chan, Wilson is able to repeat what he heard Mrs. Crane say to the murderer just before she was killed. 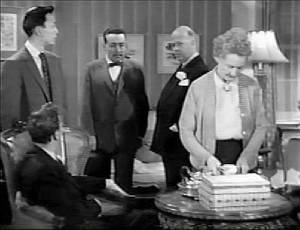 Knowing of Charlie Chan's reputation as a detective, Wilson asks him to take on the case to prove his innocence. Chan, expressing his belief that Wilson is not the murderer, agrees to help. Returning to the Cranes' apartment to continue his investigation, Chan meets with Julie Crane, step-daughter of Mrs. Crane, Dr. Dennis Pearson, Julie's fiancé, and Julie's father, Robert Crane. Mr. Crane is unaware that Chan was performing investigation work for his late wife. Chan notes that he had arrived, as arranged by Mrs. Crane, at 7:00 that evening to present his findings, only to find that she had been killed. When Chan informs Crane that the nature of his investigation was to discover the whereabouts of a certain John Bolton, Crane reacts with marked disgust, adding that she was supposed to have been at Julie’s party at that same time. Julie, with an outburst of anger, states that her step-mother was probably planning to use the information to halt the engagement. In her anger, Julie snaps at Alice who has just brought her some tea. Chan then asks Julie the meaning of what he had overheard her say just before he entered the room, "We are all better off now that she is dead, so why pretend?" Julie admits to the statement while protesting her innocence. Following Chan's assertion that, as no murder weapon has been recovered and that it could only have been taken and hidden by someone familiar with the Cranes' apartment, he notes that he believes that the killer is among those in the room. Mr. Crane, admitting that they are all better off with his wife being dead, but, Dr. Pearson adds, "But that doesn’t mean to say that we'd kill her." Mr. Crane explains that his late wife was only interested in the family's money and lifestyle, made possible by the Crane family’s successful business which had been created by Mr. Crane's late father. A provision in the will of Crane's father had stipulated that upon her marriage, Julie would receive half of the company stocks, and this would have cut deeply into the funds available to the late Mrs. Crane. Alice adds that the late Mrs. Crane was jealous of Julie from the first moment that she arrived. Before he leaves the apartment, Chan discovers a pair of scissors in a sewing box. At Scotland Yard, Inspector Duff, that though seemingly wiped clean, has the scissors examined at the laboratory for any signs of blood. Within Scotland Yard, Pete Wilson, who is about to be arraigned on charges of burglary, overcomes a guard and makes his escape. Chan, maintaining his client's innocence, hears the lab report about the scissors proving the presence of blood matching the type of Mrs. Crane. Returning to the Crane apartment, Chan presents his report on John Bolton who, according to Julie, was Dennis' father who killed his wife when Dennis was a child and, found to be insane, was sent to Broadmoor Prison where he eventually died. An aunt later adopted Dennis, changing his last name to Pearson. Chan learns from the family members that the late Mrs. Crane never knew of these details and was therefore not able to use them against Dr. Pearson, who had feared the damage the information would bring his medical practice. When asked who raised her before the arrival of Mrs. Crane, Julie tells Chan that Alice had brought her up. Back at their apartment, Chan informs Barry that he is now aware of who it was who killed Mrs. Crane. Suddenly, Pete Wilson is discovered under the detective's bed. He explains that he escaped when he felt he was going to be charged with murder. Chan allays his concerns and requesting his assistance in proving his innocence. Bringing Wilson to the Cranes' apartment, Chan introduces him as his "employer" to the family and Alice. Chan tells everyone that Wilson is not the killer, but that he had heard the voice of the murderer and will be able to identify the guilty party. As Wilson fingers Julie as the killer, Alice protests, stating that she knows that Wilson is lying. "He couldn't have heard anything, because I never said a word," admits Alice. Alice states that while sewing a garment for Mrs. Crane, a taunting Mrs. Crane boasted about how she had planned to end Julie's engagement by revealing damaging information about Dr. Pearson's father, although she didn't reveal the extent of the information. Alice states that she killed Mrs. Crane with the scissors in order to protect Julie, "The only child I’d ever had." With regret, Chan informs Alice that the family was already aware of the facts surrounding Dr. Pearson's father. Pete Wilson (to Charlie Chan): "You’re a detective, ain't ya? I've heard of you, you're a big shot." Julie Crane (to Charlie Chan): "He [John Bolton] was found guilty, but insane, and sent to Broadmoor Prison where he died." 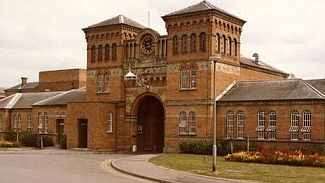 Broadmoor Prison - Opened in 1863, Broadmoor Hospital is a high-security psychiatric hospital in Berkshire, England. It is the best known of the three high-security psychiatric hospitals in England. Because of its high walls and high levels of security and the inaccurate news reporting it has received in the past, the public perception is that Broadmoor Hospital is a prison. Rarely does one hear roar of lion come out of mouse's throat. Money is not important, but murder is. Past of client has no bearing. Politeness, like old wine, improves many occasions. I have heard that in moments of peril, even small mouse will bite. I fear I have always been known for my obstinacy. To use a genuine love, even to trap a person who has taken another's life, sometimes is very distasteful.